Honey bees get all the press, but the fascinating story of North America's native bees—an endangered species essential to our ecosystems and food supplies—is just as crucial. Through interviews with farmers, gardeners, scientists, and bee experts, Our Native Bees explores the importance of native bees and focuses on why they play a key role in gardening and agriculture. The people and stories are compelling: Paige Embry goes on a bee hunt with the world expert on the likely extinct Franklin's bumble bee, raises blue orchard bees in her refrigerator, and learns about an organization that turns the out-of-play areas in golf courses into pollinator habitats. 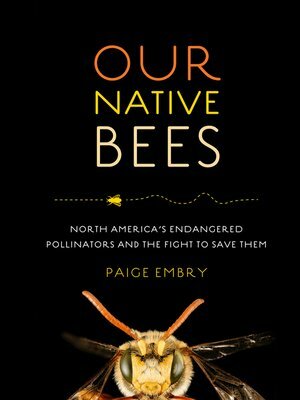 Our Native Bees is a fascinating, must-read for fans of natural history and science and anyone curious about bees.